How to integrate jBPM in netbeans7.3?? 1. Re: How to integrate jBPM in netbeans7.3?? Hi, some screenshots about what?? You don't really need to much to integrate jBPM with Netbeans. You just need to add the jBPM dependencies to your project. 2. Re: How to integrate jBPM in netbeans7.3?? 3. Re: How to integrate jBPM in netbeans7.3?? Yeah.. I would recommend you switching to maven, it will make your life easier. If not you will also need to add all the transitive dependencies which usually maven will resolve for you. And that's a really tedious job until you get it done. 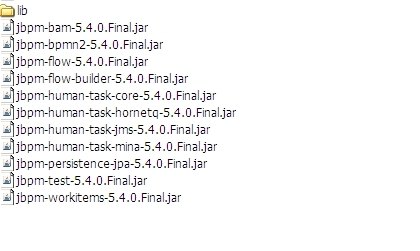 When you download the jbpm-installer you will find a lib directory that contains all the things required for jbpm to work, so I recommend you to add all those jars into your project. 4. Re: How to integrate jBPM in netbeans7.3?? 5. Re: How to integrate jBPM in netbeans7.3?? Hi, can you please mark the question as answered? 6. Re: How to integrate jBPM in netbeans7.3? ?